Lunch at an outdoor patio. 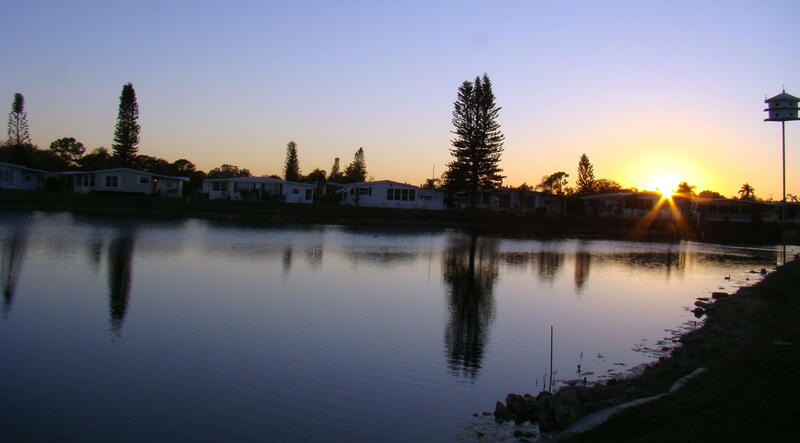 Ever wonder how the Snowbirds live in Florida? Come along for a trip to southern Florida and see how these folks entertain themselves from day to day. Actually, they seem more like children than adults, playing at being grown-ups while enjoying the freedom of children. This is basically a life of leisure, and everyone runs on their own schedule in the mornings. Some are early risers and like to swim in the pool or exercise before the day gets warms. Others tend to sit back in their recliners and watch the morning world come to life outside their windows. 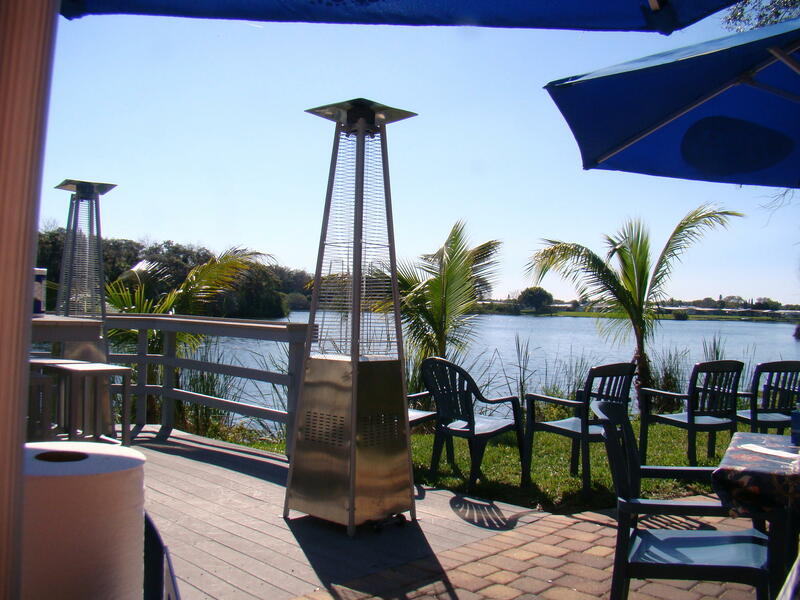 Most live near the water so there is always entertainment nearby. The appearance of egrets, ibises, sea gulls and turtles in the nearby lake adds joy to the day. One of the neighbors might decide to throw some bread towards the birds and then the fun begins. 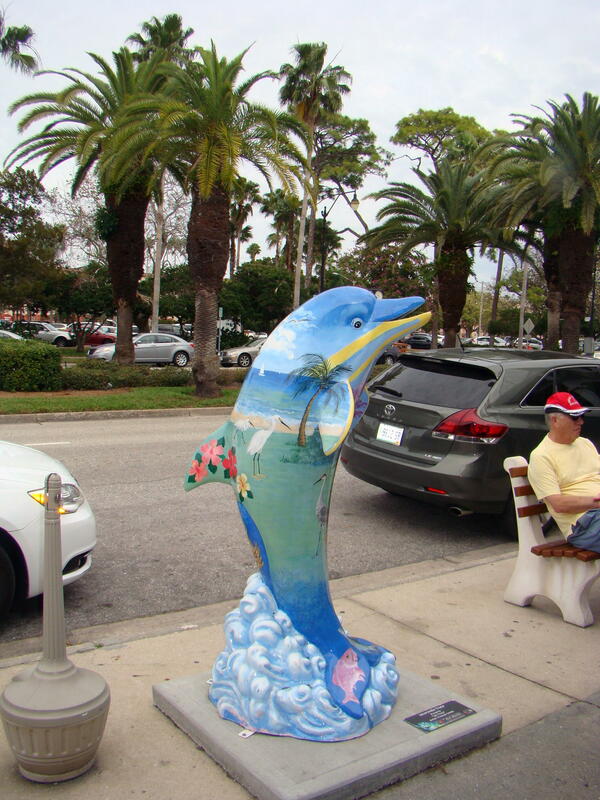 Dolphin statues line the streets as part of Sea Venice Arts Project. More sea gulls than you thought were in the area, suddenly appear wanting a taste of bread.Turtles even rear their heads out of the water for a tasty treat. They are usually unseen in the water, but when feeding time comes along, their long necks reach out to grab a bite. Once in a while, they will climb out on a rock to sun themselves. Shopping seems to be one of the favorite activities for men and women alike. The men usually head to Home Depot while the women check out all the downtown stores almost every day. Most of the time they just look, but sometimes they are tempted to buy a colorful blouse or capris – Florida style. 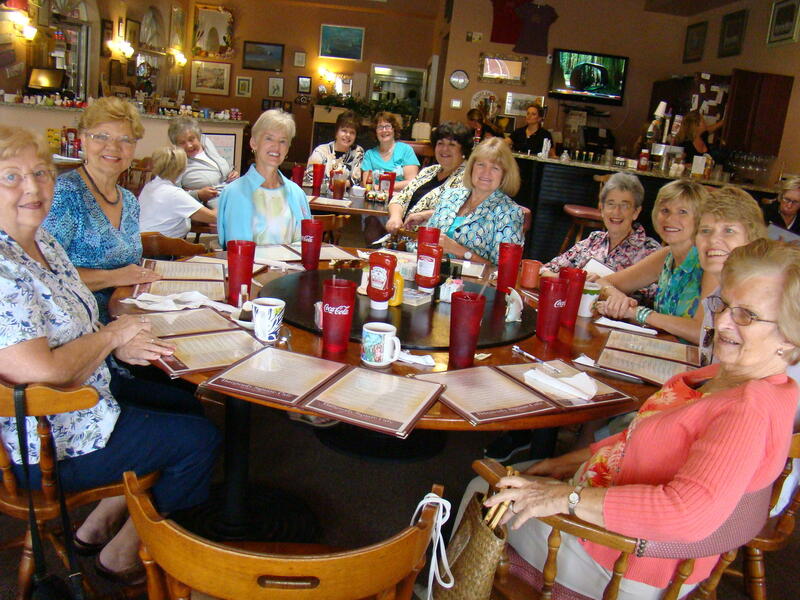 Two tables of Buckeye Ladies gather for their weekly luncheon. Of course, shopping without lunch isn’t a possibility. All the Buckeye Ladies gather once a week to keep in touch with home news as well as form new friendships. Their weekly gatherings also give them a chance to try a different restaurant every week. You can be certain that quite often seafood is a part of the menu. On the days when they’re not shopping, lunch on the patio is the order of the day. Everyone enjoys sitting out in the sunshine where they can enjoy fresh air, a gentle breeze, and a quick sandwich and soda. Afternoons are spent visiting. These are the friendliest people you could imagine. Ladies ride their three-wheel bicycles from house to house, sharing their latest purchases and bakings. Somehow these ladies still find time to bake the tastiest cookies when they are home for a few minutes. Surprise visitors pop in unexpectedly quite often. If you have a home in Florida, you can expect company from the northern states to stop by to say hello anytime they are in the area. Refrigerators are well stocked so there is always something the men can throw on the grill, while the ladies can whip up some extras without too much problem. Steaks and hamburgers are quite popular on the grill and the guys seem to handle this with ease. Then the ladies will toss a salad, fix some potatoes, and always seem to manage some fresh fruit for dessert. Evenings might be spent playing cards or Scrabble around the table with friends who just happened to stop by. A card game called Head and Foot seemed to be popular as it could be played without too much concentration. That way everyone could visit and play cards at the same time. The Club House is also a popular place for friends to gather in the evening for Bingo. They are quite serious about plans for the evening as snacks are packed in coolers and everyone makes certain they have their Bingo spotter with them. The game is a fast moving affair with helpful eyes on everyone’s cards. These adult children enjoy their relaxed lifestyle and that is what retirement should be all about. There is no doubt that the climate is perfect for the Snowbirds during the winter months. But visitors must return to the cold blasts of northern winter. 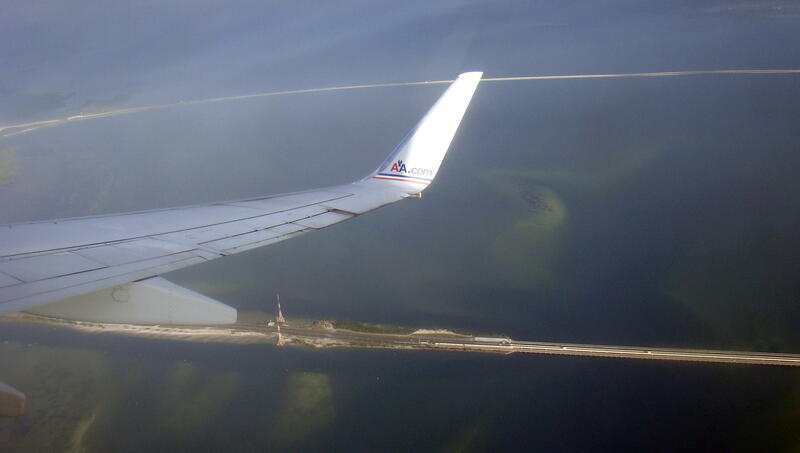 Flying out, the scene of the causeways crossing Tampa Bay is a great way to say goodbye to a beautiful Florida visit. Thanks for sharing! You guys have the life down there in Florida, but it will soon be Springtime here in Ohio and we will forget all about our nasty winter. Not sure where you are located E.D., but here in Ohio the winter has been the worst I remember, especially temperature wise. A visit to Florida was a nice break from it all. Thanks for taking a Gypsy Road Trip. I will check out your posts from time to time. Everything interests me!